Skywalk walkway at the Grand Canyon development group including the designer, architects, contractors and engineers are all located from Las Vegas, Nevada. Skywalk transparent walkway will allow Grand Canyon visitors from around the world the ability to step out over the edge of a cliff and look 4,000 feet down. This glass, steel and u-shaped structure is located on the Hualapai Indian Reservation in Arizona. It is located about 120 miles east of Las Vegas real estate. The two day move of the million pound structure will be done at the cliff’s edge, 60 feet over the Grand Canyon. 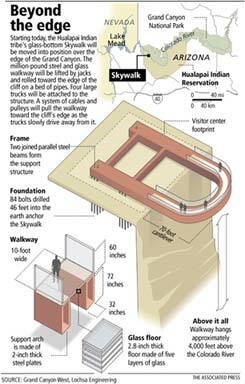 The walkway will be welded to huge anchors of high strength steel imbedded deep into the bedrock. The attraction in Arizona is projected to open on March 28, 2007. Las Vegas businessman David Jin thought of the attraction in 1996.